I’m a really big fan of American “art pottery, so you can just imagine me doing a little jig of joy in my office when we recently acquired this gorgeous pitcher from the Brooklyn Museum! 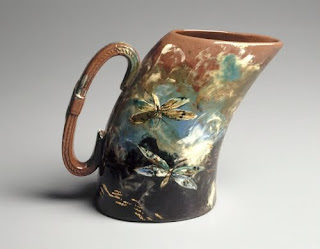 If I could fit a kiln into my living room and a potters wheel I’d give up painting, because the decoration of this pitcher looks totally Impressionistic / Expressionistic. I TOTALLY love Rookwood, because, not only did I once have lunch in the kiln (Rookwood factory is now a restaurant) with my godmother in Cincinnati, but because so many of their works have a painterly quality in their decoration (guess why I like that). Also, in the Fisher Mansion in Indianapolis, every room has a Rookwood fireplace mantle and surround! Gorgeous! 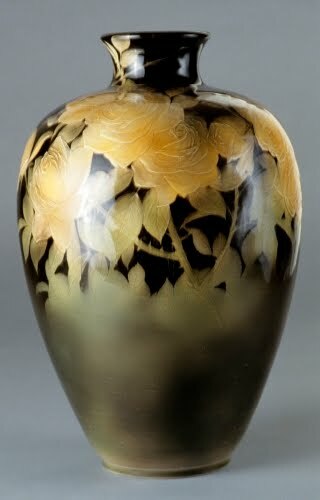 The art pottery movement in America began in the 1870s. It is suggested that the Philadelphia Centennial Exhibition in 1876 exposed American ceramic artists to Arts and Crafts movement ceramics from England. 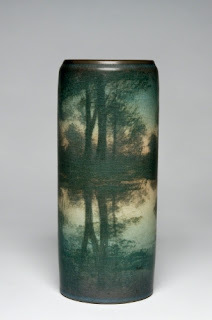 Many artists who later worked for art pottery kilns were inspired by the Philadelphia exhibition. Scholars define American art pottery as a type of ware made from the 1870s to the 1920s. Starting in the 1880s, pottery painting had become very popular among American women. It was considered a "refined" occupation for women to undertake. This was due to the fact that the art form could be executed in the home. The popularity of pottery painting among American women spread quickly and pottery societies were formed under women’s leadership all over the country. They soon changed from simply painting pottery to modeling, firing and glazing ceramics. Ironically, an art vocation meant to keep women in the home actually led to hundreds of women working in pottery factories throughout the US. Maria Longworth Nichols founded the Rookwood Pottery manufactory after visiting the Philadelphia Centennial Exhibition in 1876. She was an enthusiast for decorating ceramics. In Philadelphia she was impressed by the Arts and Crafts style coming out of England, and also of the understated elegance of Japanese ceramics. The common perception at the time was that American ceramics were inferior to European and Asian works. Nichols sought to change that when she established Rookwood, believing that quality ceramics could emerge from an environment filled with talent, ideas and inspiration, regardless of gender. She became the first woman head of a manufacturing company in the US. Unfortunately, I can’t find any information on Clara Newton, but apparently she was an artist at Rookwood in the early days. 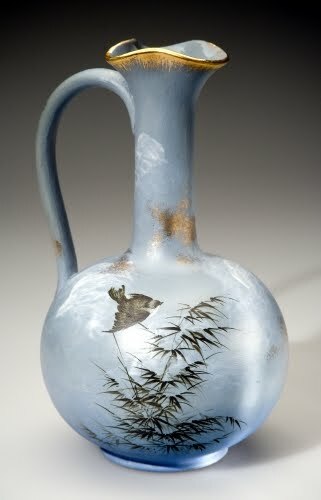 Her decoration of this pitcher soooooo anticipates designs in Art Nouveau art works! Additionally, I wonder if her painterly background was influenced by the recently-introduced-in-America painting style of Impressionism? Here are some other beautiful works from Rookwood. Shirayamadani was an immigrant from Japan and I find his pieces absolutely stunning.